Warrnambool Verterinary will be running a pet dental month promotion throughout August to raise awareness of pet dental problems, prevention and treatment, particularly in older pets. It’s never too late – seniors need dental care too! 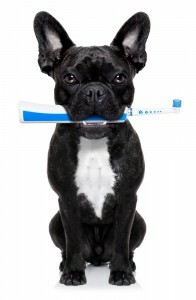 Is to educate pet owners about the benefits of annual dental health checks and regular tooth brushing for older pets. Warrnambool Veterinary supports this promotion with our Free Dental Health Checks. Four out of five dogs and cats over the age of three years have some sort of dental disease which may go unnoticed by their owners. Pets often won’t show pain. Even pets with sore gums, infected mouths and broken teeth will continue to eat so owners may not see any problems. So how can you tell if your dog or cat has a toothache? Your pet’s breath should not smell bad. Bad breath is a sign of infection. Gums may be red and inflamed and the teeth stained with tartar or they may start dropping food. Annual dental health checks are an ideal opportunity for owners to find out if their pet has existing problems which have gone unnoticed. Dental health checks also help ensure bacteria and poisons from dental infections do not spread to the heart, liver and kidneys through the blood stream. We also recommend regular tooth brushing and many cats and dogs can be trained to enjoy having their teeth brushed, especially if you start at an early age. About 80 per cent of adult animals have some degree of dental disease, which becomes more severe with age. Warrnambool Veterinary provides FREE Dental Health Checks and the Pet Smiles Program. Discharge appointment including dental care advice and free sample of dental food. No worse than grade 1 dental disease – this means early onset of gingivitis and tartar build up. Pets with more extensive dental disease will be subject to our normal dental surgery fees. If your pet does not meet these criteria, the vet will advise you as to the best course of action to address their oral health concerns, and provide a full cost estimate for your consideration. Book your pet in for a free dental check! Its never too late!